In a blog post from last year, we enumerated the ways in which Knowledge Mosaic lets you share your search results with a colleague –including email, batch download, and Excel report generation (to name only three of the seven). 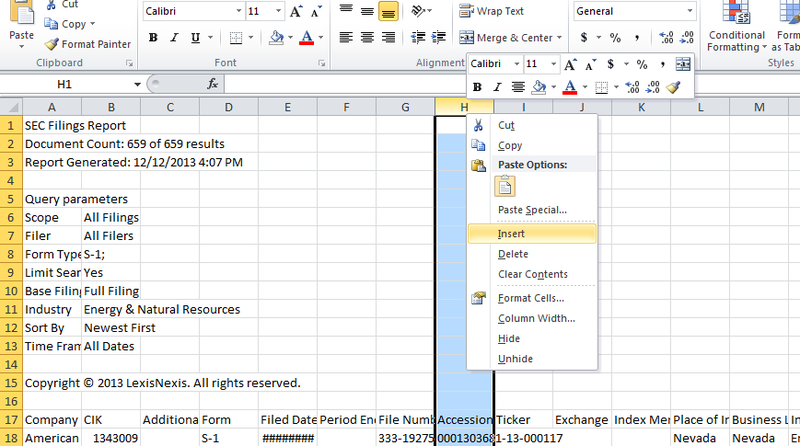 Today, we offer a trick that makes the Excel report even more valuable. 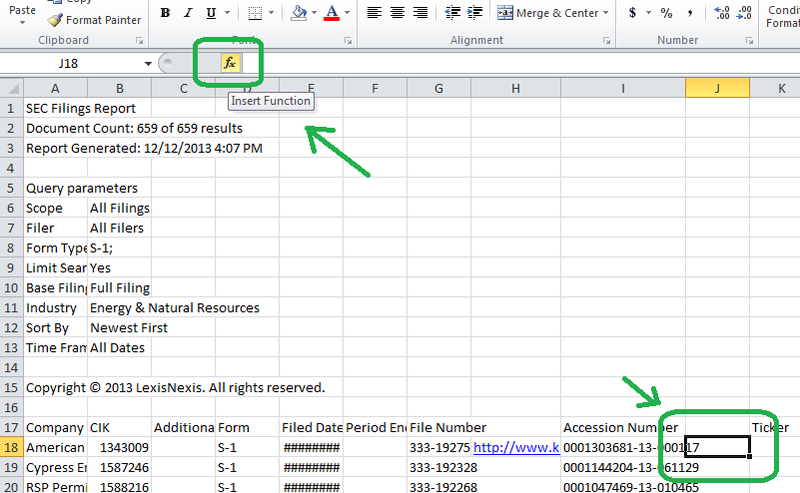 By following these simple steps, you can create hyperlinks to documents in the spreadsheet you generate from the Knowledge Mosaic SEC Filings page. Step 2. Insert three new columns into the Excel spreadsheet: one to the immediate left of the accession number column (Column H), another to the immediate right, and a third anywhere you like — that’s the one where your URL will eventually appear. (It’s best to paste the URL stub as text only rather than as a hyperlink.) Then copy and paste that stub in the subsequent rows, all the way down the column. Step 6. Copy the new contents of that cell — i.e., the formula result, a full URL created by concatenating the URL stub and accession number — on down the column. Step 7. Convert the URL to a hyperlink. In whatever column you created as a placeholder for the hyperlink, click into the cell corresponding to the first result. Deploy the formula bar and select “HYPERLINK.” In the function arguments dialog box, designate the link location by clicking on the cell containing the full URL. (Optionally, you can also choose a “friendly name” that will contain the hyperlink — it could be “filing,” or “link,” or “Fred,” or “Ethel” — whatever works for you.) Click OK. Finally, copy and paste the cell contents down the rest of the column. And don’t forget to save your document!